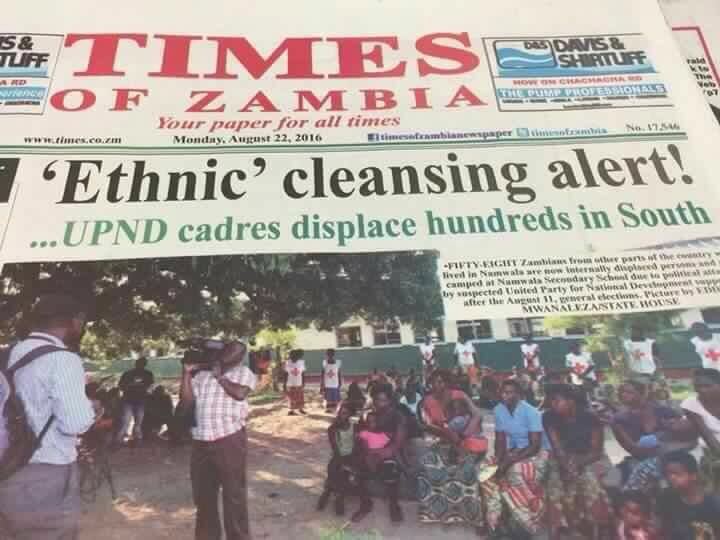 I just hope the director general of ZNBC and editor of Times of Zambia Bestone Ngonga know the consequences of the ethnic cleansing they are preaching. After closing Muvi Tv and other radio stations that could have told the other side of the story, the country is now inundated with so much hate speech against specific tribes by government media. The result is agitation accross the country due to ZNBC, Times and Daily Mail plus Daily Nation. Granted whatever happened in Namwala is wrong. But what about the thousands of opposition supporters who have been driven out of their homes from Lusaka and kicked out of their small businesses in markets in Lusaka? This information is not told because ZNBC and Times of Zambia want people in Luapula or elsewhere to kill other tribes. What will happen if people in Luapula kill other tribes then the people in North Westen also attack other tribes in revenge? What if people in Easten also rise against other tribes, then the people in Barotseland also take on other tribes? Please ZNBC stop this murederers journalism before lives are lost. We know Frank Bwalya and Mumbi Phiri are promoting this hatred but be assured that if things get out of hand, everyone will be affected and no one will emerge winner. My specific question goes to Vice president Inonge Wina, do you support the message targetting to kill Lozis? And to Brian Hapunda, how do you feel when your partners are saying they will kill Tongas in other parts of the country? Mulusa, will you clap when people of Northwestern are murdered just because you want a job?